We all remember the mixed reviews (a.k.a. hate) on the Anastasia Beverly Hills Subculture palette last summer and then the non-reaction to Prism but ABH managed to turn it around with the release of Soft Glam earlier this year, which was universally praised. They got it so right with everything from the shade selection to the texture and pigmentation of the shadows. Therefore, my hopes were set high for the Norvina palette. 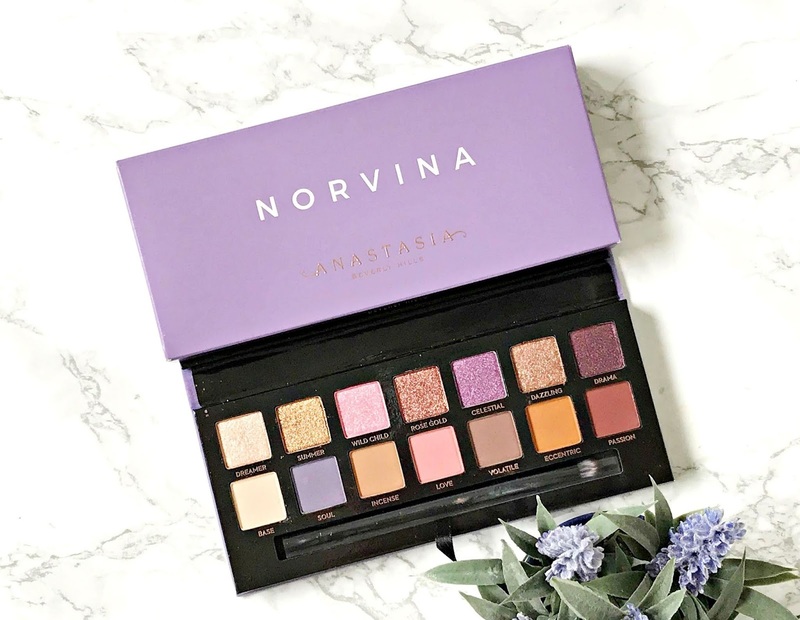 No, I didn't need another palette but I have a weakness for purple eyeshadows and also for Anastasia Beverly Hills eyeshadow palettes so I went ahead and ordered the Norvina palette on the day it was released on the ABH site. It will be available from Cult Beauty from this Wednesday as far as I am aware and you can sign up for notifications here. 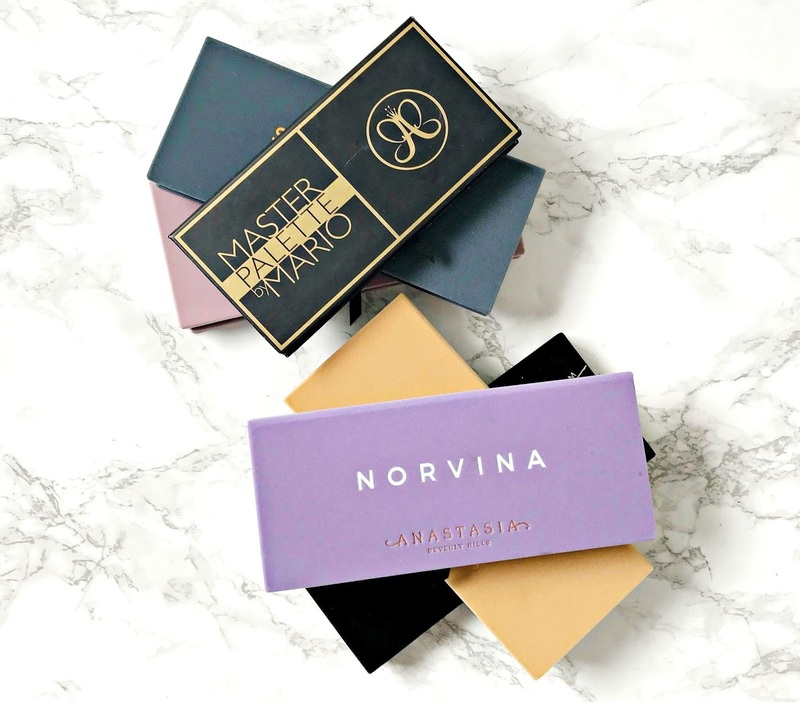 I'm not a fan of the velvet covered lid that Anastasia Beverly Hills palettes have - they can get grubby very quickly if you aren't careful but it is what it is. This palette is no different with a purple lid to reflect the purple shades in the palette. The overall shade selection is cooler than I would normally go for but it's not entirely cool toned as you'll see in the swatches. The pigmentation is off the scale - no duds here and the texture of the shadows is buttery soft. Just don't go digging for gold like lots of people did last year with the Subculture palette - that is a surefire way to hit pan long before you need to. Let's move on to the shade selection. Swatches completely unedited. From left to right: Dreamer, Summer, Wild Child, Rose Gold, Celestial, Dazzling and Drama. Dreamer: A soft pale oyster metallic shimmer. Summer: A coppery gold metallic shimmer. Wild Child: A medium pink shimmer. Rose Gold: A rose gold - copper hybrid shimmer. Celestial: A medium purple with a shimmer finish. Dazzling: A true bronze metallic shimmer. Drama: A deep plum satin. Swatches completely unedited. From left to right: Base, Soul, Incense, Love, Volatile, Eccentric, Passion. Base: A medium creamy beige matte. Soul: A cool toned deep purple with a slight shimmer but mainly matte. Incense: A warm medium matte brown. Love: A medium satin pink. Volatile: A cool toned deep taupe matte. Eccentric: A warm medium matte brown with orange undertone. Passion: A deep plum toned matte brown. The metallic shimmers in the top row are intensely pigmented and apply beautifully with a flat shader brush or with a finger. 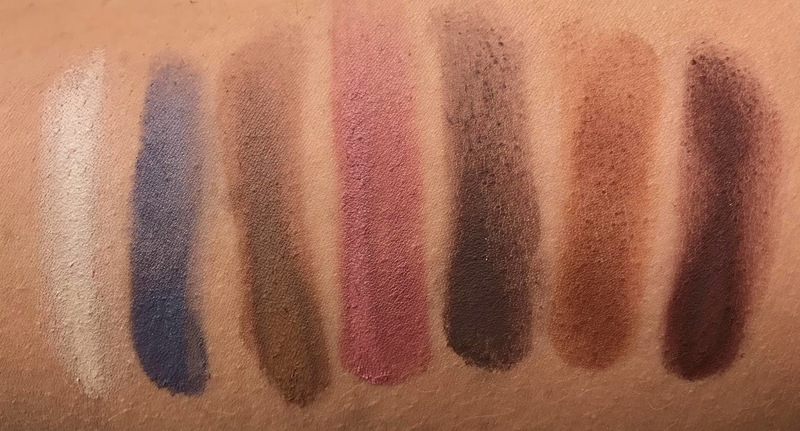 The mattes are finely milled and very pigmented so I find that it's definitely necessary to tap your brush on the edge of the palette before applying to prevent fall down. They all apply well and evenly (actually Drama is the exception, it can be a little patchy and my least favourite shade) and they don't blend into one colour on the lid. As for longevity, as you'd expect with Anastasia Beverly Hills shadows, they last a good 10 hours on the lids. Overall I'm very happy with this palette and I find the shade selection to be very cohesive. Now on to the giveaway! When I received this palette, I loved it so much that I had to order another one to give away to one of my lovely readers! The rules are really simple. There are 4 mandatory steps - all of which are detailed in the Rafflecopter widget below. You must follow Beautylymin on Bloglovin, Twitter and Instagram and you must tweet the giveaway link. All of the links are in the Rafflecopter widget. If you leave any section empty or with NA, your entry will be deleted and if you follow/unfollow, your entry will be deleted. There are a number of ways to earn extra entries: love this post on Bloglovin, comment on this post telling me which product appeals to you most, leave a relevant comment on any other blog post, like and comment on the Instagram photo and tag two friends on the Instagram photo, mention the giveaway in your instastories and tag beautylymin (this option can be done daily). These are optional but all are worth five extra entries each. The giveaway will end on August 20th at midnight and the winner will be chosen via random.org. I will then contact the winner who will have 48 hours to respond to my mail. If the winner does not respond within 48 hours, they will be disqualified and another winner will be chosen. If you are under 16, you must ask the permission of your parent/guardian to enter as you will have to disclose your address. This giveaway is open internatioanlly. There is no cash alternative or substitution available. I can't be held responsible for any damage that may occur once posted, any missing parcel or any fees incurred, however I will mark the parcel as a gift. Best of luck!